The SANJIVANI SUPER SHOW! 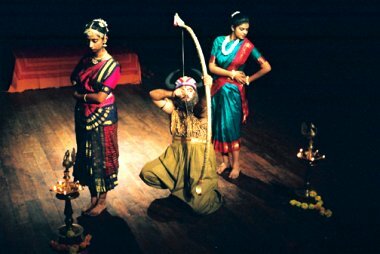 is an adaptation of the classic Kannada play, SANJIVANI by noted playwright Adya Rangacharya. It is an amalgamation of the old & new, of myth & reality. Through the use of mannequins who are eternal & everlasting (like SANJIVANI), the play makes a statement on the perception of love & value systems in contemporary life. The inspiration behind staging shows of the play is to create a theatre audience among students & young people. It is also our intention to make theatre accessible to everyone - besides creating an atmosphere, which is conducive to ideas; and progressive thought. Which do you prefer? Directing your own scripts or other writers’? I direct my plays because no one directs them. But I've done interesting work when directing the great masters. Basheer's ME GRANDAD AD AN ELEPHANT, Margaret Duras' L'AMANTE ANGLAISE, Samuel Beckett's KRAPP'S LAST TAPE. What subjects have you handled in your scripts over the years? Anything, everything that helps me ask questions and take "punga". For e.g. I'm writing a new play 3, SAKINA MANZIL. This is about the 1944 Dock Explosion in Mumbai. And the gold flying through the sky...along with human limbs! About World War II, the threat of Japanese aggression and the golden era of Hindi cinema! Amrit Gangar (like Virgil) has been my guide in the gallis and khopchas of Pydhonie, Dock Yard, Asiatic Library. We've met survivors, documented amazing stories, sipped our chai and gaped at the relics and monuments. Every visit has been a discovery. Sometimes it has been the big themes. At others, the little patterns. Do you think the presence of the scriptwriter at rehearsals is necessary, perhaps to facilitate on the spot improvisations? It is said, Arthur Miller used to ghost-direct the first production of his plays. Like most playwrights, he didn't trust the director and actors. But as a rule, the playwright should steer clear from the rehearsal space. It’s a waste of time and energy-sapping. Playwrights should learn to disown their writing. In Mahadevbhai, you used the diaries of Mahatma Gandhi's secretary as the source for your play and it received rave reviews. What inspired you to write it? For me, MAHADEVBHAI is a response to the politics of our times. To start with, anti-Gandhism is rampant and then there is the systematic discrediting of democratic institutions. As I see it, there are a couple of reasons for this. For one, our politics has been communalised. This automatically makes Gandhiji an easy target. Since these days, anyone who has been perceived as pro-Muslim will be attacked. Then there are the caste politicians, who are constantly playing the anti-Gandhi card. In this sense Ambedkar and Gandhi become foes without their politics being understood. The point is, the modus operandi of the criticism against Gandhi is cloaked in subterfuge. As you're perhaps aware, there have been 3-4 anti-Gandhi plays and even mainstream films in the past decade. And all of them very popular. MAHADEVBHAI was my attempt to set the record straight, in a small way. In this sense, I was clear about devising a play that will reach-out to the uninitiated, and those members of the audience who are hostile to Gandhiji and his tenets. For me, Mahadevbhai became a tantra to reach that tatva. Do you think plays in Indian languages are effective when translated into English & vice versa? ‘The Sanjivani Super Show!’ is one such. What is most important to retain the flavor of the original work? I don't know if the Sanjivani Super Show is effective. It’s been criticised by 50% of the Kannadiga audience who have seen it. They found the play and the antics on stage, blasphemous. In Sanjivani Super Show I've tried to retain the masti, the irreverence and the musicality of Kannadiga. In the present day scenario, how feasible is it for one to take up theatre as a full time career? Theatre has never been a career for me. I've never done a play for the money. I do plays in order to share an idea, a thought. I believe in good taste, decent humour, intelligence and above all progressive values. And in today's times wherein everything has a price tag, it becomes difficult to sustain such hopeless ideals.